For links to more language activities and resources, click on / German / in the menu at the top of this page. Scroll down and click on a topic that interests you. Explore a map of the EU and find facts about Germany and other EU countries. Click on the play buttons, or to find more German activities, click on "Fun with German" in the left menu. A classic bilingual German/English word book, illustrated with busy scenes and labelled pictures to help children learn key German vocabulary. Includes an English/German word list and a pronunciation guide to ensure effective, long-term learning. 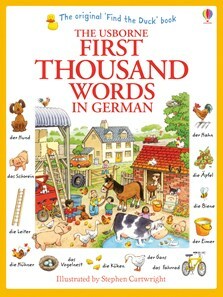 Readers can hear how to pronounce every word by listening to a native German speaker at the Usborne Quicklinks website. Fully revised and updated for 2014 and beyond, with new words added, redundant words removed and pictures updated.